You know, in school and in newspapers, the experts warn you about all the dangers of global warming: melting ice caps, rising sea levels, more destructive hurricanes. All bad stuff! What they don’t tell you is that when it gets to be around 120-degrees, the sidewalk gets so hot, it can fry a puppy paw instantly. Can you imagine the horror these poor pups are facing?! They’re not the only ones dealing with some undeniably extreme consequences of the historic heatwave tearing through the Southwest right now. In Tucson, the forecast predicts that the Arizona town is about to experience the hottest seven-day stretch in its history, with highs soaring north of 110-degrees for an entire week. According to the National Weather Service, Phoenix tied its high temperature record of 118-degree on Tuesday. Guess when the last time the city saw a temperature that high was? June 20, 2016. And when it’s this hot for long stretches of days, everybody suffers. Did you know that airplanes have maximum temperatures at which they’re able to operate? That’s partly because hotter air is thinner than cooler air, making it difficult for planes to take off. On top of that, there are all kinds of issues with overheating. The Bombardier CRJ jets that American Eagle uses for regional flights top out at 118-degrees, which is part of the reason why 50 flights in and out of Phoenix were grounded on Monday and Tuesday. Because the old fry-an-egg-on-the-sidewalk trick isn’t that impressive in heat like this, a team of National Weather Service meteorologists baked cookies and fried bacon on a car’s dashboard. They said the car’s interior temperature was about 200-degrees at the time, which you can barely see on the thermometer in the image above. Some of those most vulnerable in heatwaves like this are migrants attempting to cross the border in the middle of the desert. This is a very bad idea in 120-degree temperatures. “It is physically impossible for the average person to carry enough water to survive several days of walking through the desert,” United States border patrol said in a statement. This one’s just ridiculous. Since former Sheriff Joe Arpaio’s controversial outdoor prison still hasn’t been shut down, the inmates there have to suffer through the heat in their tents. Some are allowed to leave during the day for work furlough, but they still have to go back to Tent City to sleep. Even at night, temperatures are north of 100-degrees. On the bright side, Joaquin Enriquez, a spokesperson for Maricopa County sheriff’s office told The Daily Beast that inmates “are given unlimited access to ice water” during deadly heatwaves like this one. The National Weather Service maps usually show a mix of green, yellow, and orange in the summertime. If it’s especially hot somewhere, you might see a scary red to represent temperatures north of 100-degrees. The same heat conduction effect happens on other surfaces, too. Just look at Death Valley, where air temperatures of 111-degrees yield gravel temperatures of 162-degrees. 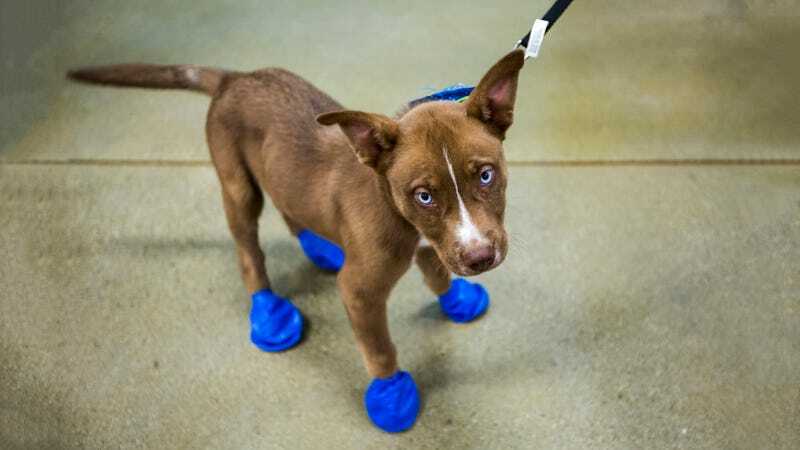 So, if you need to take your dog for a walk, buy him or her some little protective dog booties. That will keep those paws safe and look adorable otherwise. The National Weather Service isn’t joking around when it say that a heat wave like this is deadly. Drink lots of water. Stay as close to an air conditioner as possible. Avoid going outside in the middle of the day. And be safe.